Immigrant experiences. They're being talked about a lot nowadays with everything in the news and our current political climate. It's important to give kids books that will show them different ways of life and how life can be for immigrants to this country. It's also important to give kids engaging stories with plenty of humor about characters they will care about and root for. Luckily, young readers will find both in Front Desk by Kelly Yang (Scholastic, May 2018). Mia's family lives and works at the Calivista Motel, one of the best jobs her parents have had. A room is included, so they don't have to pay rent. And they're lead to believe that they will make a good salary on top of that. But the stingy motel owner Mr. Yao will do anything to gouge his employees. They're not allowed to swim in the pool (because then everyone will want to swim in the pool and do you know how much it costs to launder that many towels?!). They have to answer the door even in the middle of the night. And they can never leave the front desk unattended. Which means that while her parents clean the rooms, Mia helps out by checking in guests and taking care of their every need. And she helps her parents sneak in fellow immigrants who need a place to crash. If Mr. Yao found out about that, you can bet they would lose their jobs in a split second. But these folks have nowhere else to turn and Mia's parents can't turn them away. Based on experiences from the author's own childhood, this is an amazing debut and a novel that everyone should check out. It has so much to say about immigration and racial issues in this country, and it approaches these issues in a really kid-friendly way. As Mia and her family are running the motel, they run into many immigrants who need a place to crash and they share their stories. Stories like employers taking their passports and IDs "for safekeeping" but really to hold immigrant workers hostage and immigrant children avoiding playing sports at school because their families don't have health insurance and the risk of injury is too great. Above all, Mia is a big believer in dreams. She and her classmate Lupe talk about two roller coasters - one crappy roller coaster that poor people are stuck on, a self-perpetuating ride they can never get off because they can never get ahead. Just when all the bills are paid, someone needs to go to the hospital and there's no insurance and here you go around the track again. Then, there's the other roller coaster - the rich people roller coaster - much nicer with your ride paid for the people who came before you - your family who can send you to the best schools so you get the best jobs and the best salaries. Mia and Lupe have many conversations about how to get off the low roller coaster and join the higher roller coaster. It seems impossible, but they can dream about it. Maybe all it takes is one lucky break. Hand this to kids who like realistic fiction with plucky heroines who are learning never to give up on their dreams. For kids who love Mia's indomitable spirit and can-do attitude, hand them Three Times Lucky by Sheila Turnage or All Four Stars by Tara Dairman. For more stories about kids living in unusual places, try All Rise for the Honorable Perry T. Cook by Leslie Connor or Al Capone Does My Shirts by Gennifer Choldenko. For kids who are interested in reading more about kids living in poverty, hand them How to Steal a Dog by Barbara O'Connor or Crenshaw by Katherine Applegate. For kids interested in immigrant experiences, hand them A Handful of Stars by Cynthia Lord or Return to Sender by Julia Alzarez. 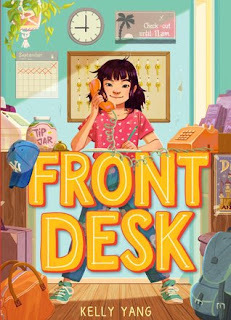 Front Desk by Wendy Yang. Grades 5-8. Scholastic, May 2018. 286 pages. Reviewed from ARC provided by publisher.